Last year I built a Point Hope kayak. Probably was used as some sort of retrieval kayak. Mostly, Pt. Hope hunters used umiaks to hunt, actually, they still do for the annual whale hunt. Anyway, I like the boat but it didn't track worth a hoot (pulled that term out of my euphemizer) until after I added a skeg. 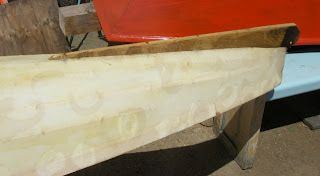 The skeg worked great on flat water, but it was too much when the wind was blowing cause the nose would go downwind. See above for original configuration. So I trimmed the skeg down and now the boat handles just fine. A few weeks ago it was blowing 35 mph in the bay with gusts up to 40. I took the pt. hoper out paddling and it did great. It kicked up a little spray, but the upturned nose never dove into any of the short waves, lifted right up and bobbed right along. I think I paddled into the wind for about 20 minutes and then returned downwind in about 5.